Chocolate Hazelnut No Bake Cheesecake- an easy-to-make, indulgent chocolate dessert, topped with hazelnuts. Perfect summer dessert. 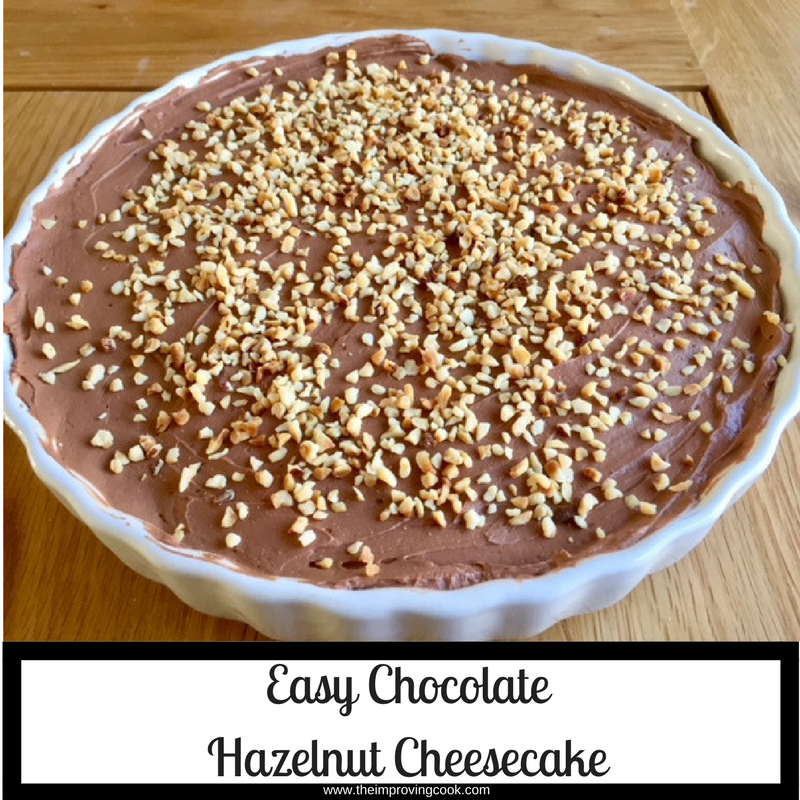 Chocolate Hazelnut Cheesecake is such a Summer dessert so, on a surprisingly, scorching hot Bank Holiday Monday, it seemed just the right dessert to make. Most of my favourite desserts are rather traditionally British and wintery. (Check out my three fruit crumble recipes for evidence! 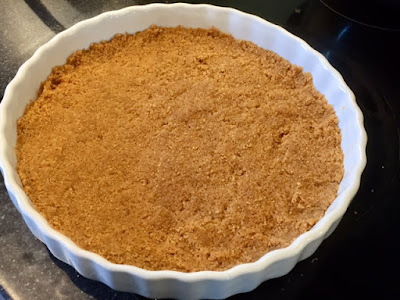 Apple Crumble, Rhubarb Crumble and Summer Fruits crumble) A big old bowl of something deliciously stodgy slathered in custard isn't really what you want after a summer BBQ though is it? Cheesecake is much more summery and if you add chocolate to it, so much the better! 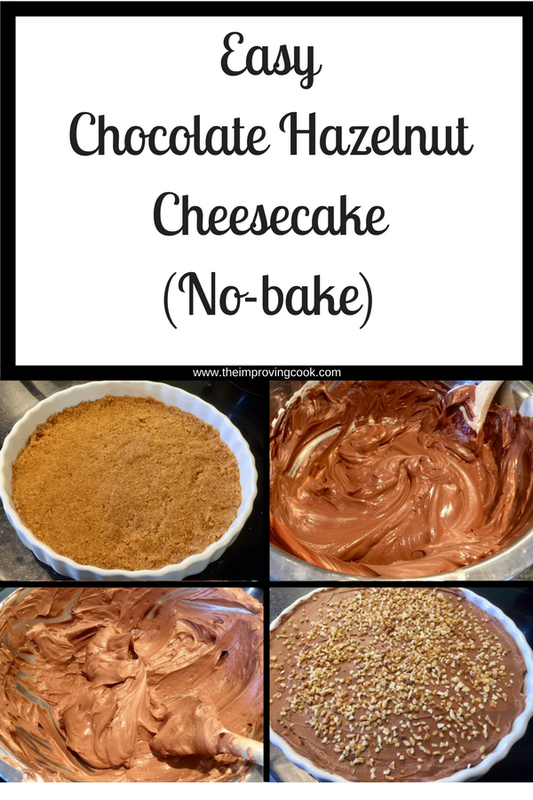 This recipe for Easy Chocolate Hazelnut Cheesecake is the no-bake variety of cheesecake, so no need to put the oven on in the hot weather. It has chopped hazelnuts in the base as well as sprinkled on top, so it has a slightly Nutella like taste but without the overpowering levels of sweetness. Instead, the chocolate flavour comes from good quality, dark chocolate and just a touch of sugar. I will warn you though that the dark chocolate makes the cheesecake very rich. It's not something you will want to cut a large slice of. If dark chocolate is too much for you, you could switch half of it out for milk chocolate. If nuts aren't your thing, you can leave the hazelnuts out of the base and sprinkle honeycomb or white chocolate shavings over the top instead. I used light cream cheese in an attempt to pull back some calories, and as I mentioned before, I cut back on the amount of sugar that most cheesecake recipes require. The recipe for this Chocolate Hazelnut Cheesecake is incredibly easy. You'll need two or three bowls (or a helper to wash one up in between) but there's no fancy skills required. It would be a great dessert to make with children. I'm pretty sure they would be keen to lick the bowl at the very least! Apart from being easy, it's also very impressive to look at when finished and even better, can be made the day before and kept in the fridge. A no-stress dessert! 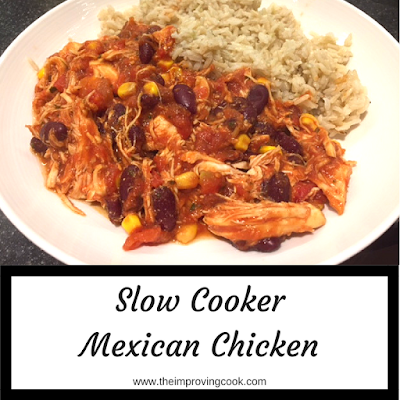 Find the printable recipe card at the bottom of this post. 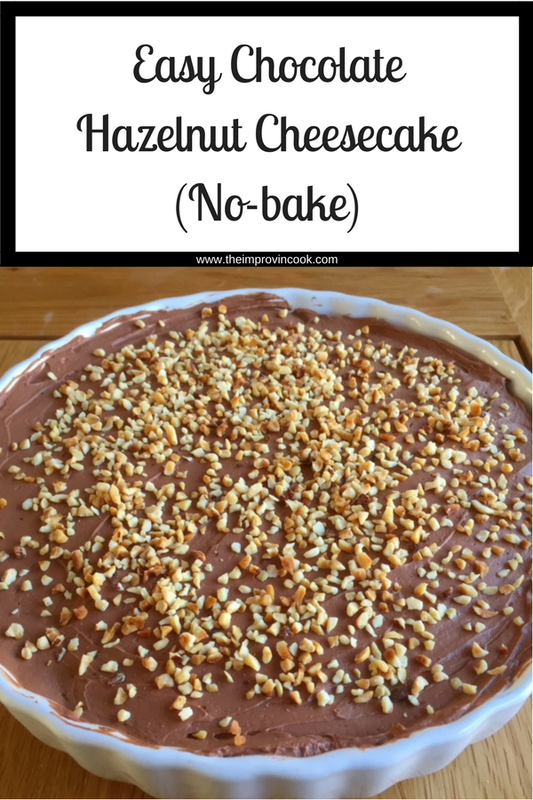 Chocolate Hazelnut No Bake Cheesecake- an indulgent chocolate dessert for Summer. 1. Start melting the butter in a small saucepan. 2. Crush the digestives into a fairly fine biscuit powder using a food mixer. If you don't have one, then popping them into a large freezer bag, pushing the air out, sealing it and then using a rolling pin to crush them, works well. 3. 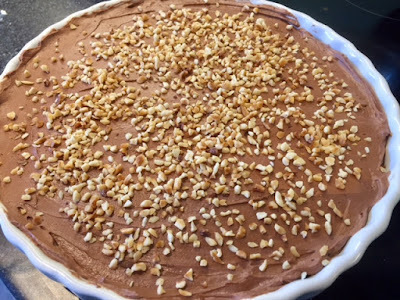 Mix the melted butter and the hazelnuts into the crumbs and then tip into a 20cm springform cake tin or a 20cm ceramic tart dish. 4. Press the crumbs firmly into the dish you're using, so they are evenly spread and as flat as possible. Pop into the fridge to set while you make the filling. 5. 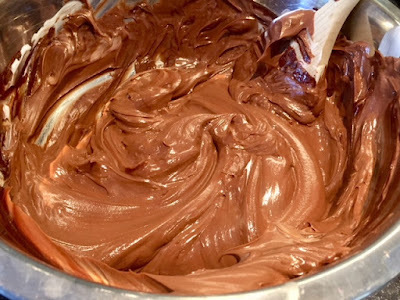 In a clean saucepan, melt the chocolate gently. Set aside to cool. 6. Mix the cream cheese, sugar and vanilla extract together. 7. 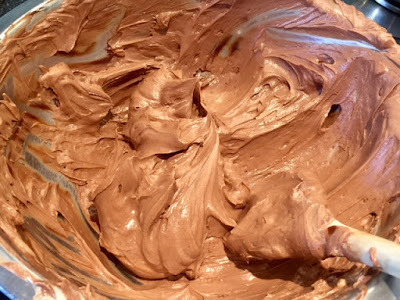 Mix the cooled chocolate through the cream cheese mixture, until it's all one colour, no streaks. Make sure you get all the cream cheese mixed through from the bottom of the bowl. 8. In a separate bowl, whisk the double cream. You want it to reach the soft peak stage, so when you lift the whisk out of the cream, the cream pulls with it, into a peak and then flops over. 9. Gently stir the cream through the cream cheese, again until the mixture is all one colour. 10. 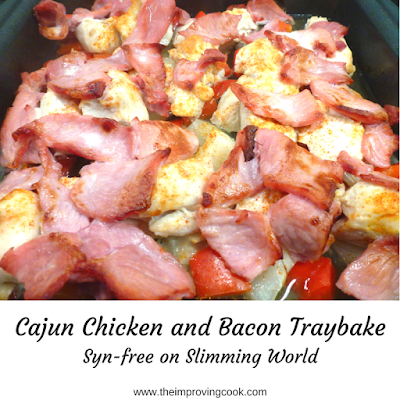 Get the dish out of the fridge and tip the topping onto the biscuit base. 11. Use a silicone spatula to spread the filling evenly across the base, up to the sides of the dish. Smooth over the top. 12. Sprinkle the chopped hazelnuts over the top and pop into the fridge to set for an hour. 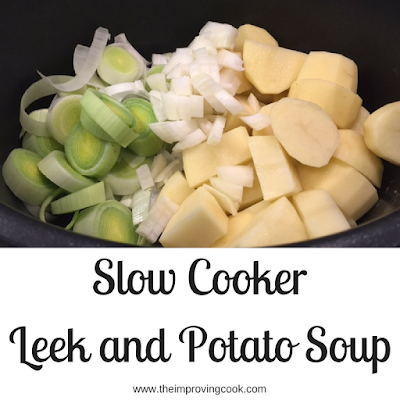 30 minutes should be enough if you need it ready quickly. If you don't like hazelnuts, leave them out of the base and top with white chocolate shavings or honeycombe instead. Serve with some fresh cream and berries to cut through the richness.